Collecting Coins, like any passion hobby or interest has built up a set of coin collecting terms. A language all of its own. Words and phrases used by coin collectors, numismatic practitioners and students of numismatics. These basic numismatic terms, which are likely to cause the most difficulty for both the novice and the advanced coin collector, are included in this coin collecting glossary. Includes the terms and phrases we come across in everyday coin collecting, whether buying, researching or selling. Everything from bag marks to fiat, scripophily and working die. Design with two heads facing the same direction and overlapping. Coins, tokens, etc., unsorted, unclassified, and unattributed; not a collection. Filing down the face of an overweight planchet. Such filing marks often survive the coining process. This is common on 18th century coins. Large cast rectangular bronze coin, one of the earliest Roman coins. A coin or other numismatic item that has been deliberately changed, usually to make it resemble a rare or more valuable piece. A series of 1ounce and half-ounce gold bullion medals issued by the U.S. Mint from 1980-84. Medals depict great American artists, writers and actors. See also medallion. Bullion coins released by the U.S. Mint beginning in October 1986. Five coins are available: a 1-ounce, .999 fine silver coin with $1 face value; a 1-ounce, .9167 fine gold coin with $50 face value; a half-ounce, .9167 fine gold coin with $25 face value; a quarter-ounce, .9167 fine gold coin with $10 face value; and a tenth-ounce, .9167 fine gold coin with $5 face value. Coins are sold at prices based on current metal prices plus a markup. See also eagle. Generally any coin issued before A.D. 500. To soften dies, planchets or metal by heat treatment. Primitive copper money of China ca. 600 B.C. (Plural: asses) Bronze or orichalcum coins of the Roman republic. Analytic test or trial to ascertain the fineness, weight and consistency of precious or other metal in coin or bullion. An assay piece is one that has been assayed. The identification of a numismatic item by characteristics such as issuing authority, date or period, Mint, denomination, metal in which struck, and by a standard reference. Method of selling by which items are presented for sale to the highest bidder. Authoritative determination of the genuineness of a numismatic item. The paper money side opposite the “face”; analogous to the reverse of a coin. A promissory note issued by a bank in useful denominations, payable to bearer and intended to circulate as money. Should not be used as a generic term for all forms of paper money. Sculpture style featuring slight differences between the raised design and the field and in which no part of the design is undercut; used to execute models for coins and medals. See also relief. The special quarter dollar, half dollar and dollar struck from mid-1975 to the end of 1976 in honor of the 200th anniversary of American Independence. Coins feature the dual date 1776-1976 and special reverses emblematic of the celebration. Issued in copper-nickel clad versions for circulation. Special 40 percent silver clad versions were sold to collectors. A form used by a buyer in an auction or mail-bid sale, on which the buyer lists the item being bid on by the number it is assigned and the price he is willing to pay. A combination form of fixed-price list and mail-bid sale. Rules may vary from dealer to dealer. However, customers usually may either buy a lot outright at the fixed price or place a bid (higher or lower). It permits buyers to purchase a lot at less than fixed price (in some cases), or by paying more, ensures a greater chance of obtaining the lot. A low-grade alloy used for some minor coin issues consisting usually of a mixture of silver and copper, and sometimes coated with a silver wash. Species considered typically North American, used on coinage and paper money of the United States; bison is a better term than buffalo, which is a more general term referring to a number of related but different species outside North America. A popular coin collecting term for the Spanish-American 1real piece (also Danish West Indies and other neighboring islands) which formerly circulated in the United States. More often used in the plural, as two bits (25 cents) or four bits (50 cents). A bit is 12-1/2 cents. The disc of metal or other material on which the dies of the coin, token or medal are impressed; also called disc, flan. In paper money, a small colored disc embedded in the paper used as an anti-counterfeiting device. In paper money collecting, a series of related notes indicated by the same prefix and suffix letters in the serial number. When the suffix letter changes, a new block is created. The suffix currently changes when the serial number reaches 99 920 000. Coin Collecting Terms Nickname given to Handbook of United States Coins, an annual price guide for collectors. The book has a blue cover, hence the nickname. Gives wholesale prices, or what dealers might pay for U.S. coins. Rhymes with “horse,” the area at a coin show or convention where dealers set up tables of collectibles for sale. Coinage metal alloy containing chiefly copper and zinc. Gold bullion coin and its fractionals to be issued by Great Britain beginning in 1987; also, the allegorical figure representing Britain. Coin struck outside a restraining collar. See also related article. paper money of a defunct bank or a bank which has failed (broken), but often applied to any obsolete bank note. Coinage metal alloy containing chiefly copper and tin. In Coin Collecting terms a Brown Back note is a Second Charter, First Issue national bank note. Has brown ink on the back. More properly: Indian Head 5-cent piece. Uncoined precious metal in the form of bars, plates, ingots, and other items. A precious metal coin traded at the current bullion price. Slight surface wear on a coin, token or medal caused by friction between it and the tray or envelope in which it is contained. On modern paper money, used as a cross reference for the plate number which appears on the margin of a currency sheet and which is trimmed from the note before it enters circulation to identify the printing plate from which the note came. On the obverse, the check number is a letter and number combination appearing in lower right corner; on the reverse, it is a number only appearing at the lower right. Often incorrectly called the plate number. In Coin Collecting Terms A small punched impression applied by Chinese (chop) or Indian (shroff) banks or change offices to attest to the full weight and metallic content of a coin. Privately-issued emergency coin-like tokens, the approximate size of current U.S. cents, which circulated during the Civil War because of a scarcity of small change. Two major types were issued: patriotic tokens, with patriotic themes; and store cards, advertising pieces often carrying the issuer’s name, address and type of business or services. See also token. Composite coinage metal strip composed of a core, usually of a base metal such as copper, and surface layers of more valuable metal, silver (or sometimes copper-nickel). Cladding is a cost-saving measure, making coins cheaper to produce while maintaining a desired appearance. In Coin Collecting Terms sometimes used to denote an incomplete planchet coin; in earlier days, clipping was a process of shaving edges of coins to remove small amounts of metal for illegal gain (which gave rise to lettered or reeded edges). Usually a piece of metal, marked with a device, issued by a governing authority and intended to be used as money. A retaining ring die within which the coin dies operate; the collar forms the edge design of the piece such as reeding or lettering. A piece issued to mark, honor or observe an anniversary, other event, place or person, or to preserve its memory. A type of U.S. paper money authorized in 1863 and 1864; they brought 6 percent interest, and were to be redeemed three years after issue. Term introduced by Dr. William H. Sheldon to denote the finest specimen and average condition of next five finest known of a given variety of large cents. Catalogers are gradually extending the use of the term to other series. Minor abrasions on an otherwise Uncirculated coin, caused by handling in Mint-sewn bags and contact with other surfaces. Sometimes called bag marks. In coin collecting terms paper money issued by the authority of the Continental Congress during the Revolutionary War. See also currency. A dollar-sized pattern struck in 1776 as a proposed coinage. Acronyms used at Bureau of Engraving and Printing for Currency Overprinting and Processing Equipment and Currency Overprinting and Processing Equipment, Packaging. Machines used to apply overprinting of seals, serial numbers and Federal Reserve index numbers to 16-note half sheets of paper money; then the COPE cuts the half sheets into single notes, bundles them into 100-note packages with a paper band, and into larger plastic-wrapped packages. Coinage alloy composed of copper and nickel in varying amounts. A reproduction or imitation of an original. Style of Liberty Head used on U.S. copper and gold coins for much of the 19th century. Liberty wears a coronet (most depicting the word LIBERTY). An object made to imitate a genuine numismatic piece with intent to deceive or defraud, irrespective of whether the intended fraud is primarily monetary or numismatic. In coin collecting terms a general term embracing most silver coins from about 20 to 30 grams in weight and from about 33 to 42 millimeters in size. The term has become applicable also to most nickel alloy coins of the same range of size and weight. Coins of 43 or more millimeters in diameter are said to be multiple crowns. A form of die break that leaves a shapeless lump of metal on part of a coin. Copper-nickel; term often employed by the government. Coins and paper money in circulation. In coin collecting terms a Date Back note is a Second Charter, Second Issue national bank note. Refers to the dates 1902-1908 found on the back. Demand notes, authorized in 1861, were the first paper money issued by the United States federal government for circulation. Nicknamed the “greenback” because of the green ink used on the reverse (back) of the note. The face value of a coin or paper note; the amount of money it is worth. The principal element, such as a portrait, shield or heraldic emblem, of the design on the obverse and reverse of a coin, token or medal. A hardened metal punch, the face of which carries an intaglio or incuse mirror-image to be impressed on one side of a planchet. Raised line on the surface of a coin, caused by a scratch in the coinage die. Spelling of the word “dime” on U.S. 1792 pattern pieces and name given the 10-cent coin authorized in the Mint Act of April 2, 1792. Probably pronounced like “steam” or “time.” The “s” is silent. A gold $20 coin of the United States. See also eagle. A die which has a multiple image created during the die-making process. Coins struck from a doubled die show a doubled image. There are many different causes of doubled dies, and many doubled die coins. Sometimes mistakenly called double die. 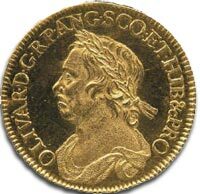 Popular slang name given to Spanish gold 8escudo pieces of the Conquistador era, often associated with pirate treasure; also, a medal in special circumstances Mardi Gras doubloon. An ancient Greek silver coin, plural drachms. Drachma is the modern Greek denomination, plural drachmas. Medieval gold coin; also any of a number of modern issues of the Dutch Mint. Modern slang has spread its use to mean ticket. A gold $10 coin of the United States. Often termed the third side of a coin, it is the surface perpendicular to the obverse and reverse. Not to be confused with rim. Edges can be plain, lettered or milled (reeded or with some other repetitious device). Edges became particularly important with the advent of machine-struck coinage. The Series 1896 $1, $2 and $5 silver certificates are called Educational notes because of the allegorical and educational themes of the vignettes. Replaced in 1899 with a new series. A copy or reproduction of a coin, token or medal made by the electroplating process. Naturally occurring alloy of gold and silver used for early coins of the Mediterranean region. An oval medalet produced by a roller die using a coin, token or medal as a planchet usually a cent. One which has been sealed in a plastic holder, especially by a third-party grading service. In coin collecting terms a postage stamp unofficially encased in a metal, plastic or cardboard frame and intended to be used as small change. In coin collecting terms a coin, token, medal or paper money item evidencing a mistake made in its manufacture. In paper money, a print made to test a design; analogous to a trial strike in coinage. See also Proof. Area on a coin generally below the main design area, often site of date. A broad category of non-money, non-legal tender numismatic items, including tokens, medals and badges. An economist is a specialist in exonumia. See also legal tender. Struck from any convenient dies to test a new metal, new alloy or new denomination; those testing a new shape; those testing a standard metal for a new denomination; and those representing changes in planchets for the purposes of combating counterfeiting. The quality of a coin’s attractiveness, distinct from any quantifiable measure of condition. In coin collecting terms the front of a currency note, generally the side with signatures; analogous to the obverse of a coin. In coin collecting terms refers to the value of a piece of currency; the denomination multiple that appears on the note or coin. An object having the physical characteristics of a coin, issued by an agency other than a governing authority yet purporting to be issued by a real or imaginary governing authority as a coin. A form of U.S. paper money authorized by the Federal Reserve Acts of Dec. 23, 1913, and April 23, 1918, and by the Act of March 9, 1933. The obligation to pay was by the individual issuing bank, not the federal government or other Federal Reserve Banks. The 1933 notes were an emergency issue to alleviate a shortage of paper money. Not to be confused with Federal Reserve notes. See also bank note. A form of U.S. paper money authorized by the Federal Reserve Act of February 1913. The obligation to pay is on the United States government and not the issuing banks. This is the only form of paper money currently being printed in the United States. Unbacked currency, which cannot be converted into coin or specie of equal value. In coin collecting terms the flat part of a surface of a coin surrounding and between the head, legend or other designs. Represents the purity of precious metal, either in monetary or bullion form. Most forms of precious metal require an additional metal to provide a durable alloy. Often stated in terms of purity per 1,000 parts: A .925 fine silver coin has 92.5 percent silver and 7.5 percent other metal. A price list or catalogue of coins, exonumia, paper money or other numismatic items offered at set prices. In coin collecting terms a coin holder, usually plastic, that has two pouches, one to hold a coin and the other to hold identification. It is folded over, or “flipped,” to close. Microscopic striations in a coin’s surface caused by the movement of metal under striking pressures. A Roman and Byzantine coin denomination; plural is folli. Referring to bullion coins, those of less that 1 ounce. Usually refers to the United States paper money issued from 1862 to 1876 in denominations from 3 to 50 cents. See also currency. Effect caused by striking a coin with sandblasted dies, often used in reference to Proof coins. An alloy of copper, nickel and zinc but no silver. Also called American silver, Feuchtwanger’s composition, nickel silver. A form of U.S. paper money once redeemable in gold coin. Temporarily made illegal for most to hold between 1933 and 1964. A gold-colored finish often used for medals or tokens. Fine scratches in the surface of the coin. Not to be confused with die scratches. A silver 5-cent coin of the United States. The Mint Act of April 2, 1792, authorizes “half dismes.” See also disme. A gold $5 coin of the United States. See also eagle. The die that performs the striking action. See also anvil die. In an auction, the price the auctioneer calls the winning bid, excluding any additional fees the buyer may have to pay for the lot. An unofficial large cent-sized copper token struck in a wide variety of types during 1833-1843, serving as de facto currency, and bearing a politically inspired legend; or issued with advertising as a store card. Gold bullion coins issued by Switzerland; also, the allegorical figure representing Switzerland. From the name given to the area by the Romans. Usually a deposit of coins, secreted at some time in the past, discovered accidentally. An Indian Head 5-cent coin with Indian bust engraved to resemble “hobo” or other individual. Engraving may also alter the bison on the reverse. A three-dimensional image on a flat surface, gaining experimental use as a security device on credit cards and printed currency. A right-reading, positive punch used to impress wrong-reading working dies. A medal issued by the official inaugural committee commemorating the inauguration of a U.S. president. The opposite of bas–relief; design is recessed rather than raised. Used when referring to coins, medals, tokens and other metallic items. In coin collecting terms the preferred name for the 5-cent coin often called Buffalo nickel. Indian Head cents, gold dollars, gold $3 coins, $5 half eagles, $10 eagles and $20 double eagles exist. A medal issued by a government agency to an Indian in an attempt to earn goodwill. The U.S. government issued Indian peace medals from the administration of George Washington through the administration of Andrew Johnson. In coin collecting terms a method of printing using engraved plates. Paper is forced into the ink-filled lines of the plate, leaving a raised line of ink on the paper. All U.S. paper money is printed by the intaglio method. As applied to value, the net metallic value as distinguished from face and numismatic value. In coin collecting terms a collectible coin made by exposing Roosevelt dimes to cesium or other radioactive substance and then placing in a special package; harmless, as any acquired radioactivity has dissipated by the time it reaches collectors’ hands. Gold bullion coin of South Africa. It is composed of .9167 fine gold. Exists in 1-ounce, half-ounce, quarter-ounce and tenth-ounce sizes. Coinage defect consisting of a portion of the metal separating from the rest due to impurities or internal stresses; common with clad or plated coinage. In coin collecting terms refers to the U.S. cents of 1793 to 1857, with diameters between 26-29 millimeters, depending on the year it was struck. A variety of coin on which the date is physically larger than other varieties of the same year. Currency explicitly determined by a government to be acceptable in the discharge of debts. Government issued precious metal coins produced for investors, they have legal tender status, and usually a nominal face value, even though they are not intended to circulate as currency. In coin collecting terms the inscription on a numismatic item. Denomination of various values and weights used throughout the ancient Greek world and in modern Greece, generally a small copper or bronze coin. An incused or raised inscription on the edge of a coin. A silver bullion coin of Mexico, containing 1 ounce of .999 fine silver. A collector of wooden nickels and similar items. In coin collecting terms a coin which has been altered by smoothing one or both surfaces and engraving initials, scenes, messages, etc., on it. In coin collecting terms the surface quality of a coin, result of light reflected from the microscopic flow lines. In coin collecting terms a gold bullion coin of Canada. It is composed of .9999 fine gold. Produced in four sizes: 1-ounce with a $50 face value; half-ounce, $25; quarter-ounce, $10; and tenth-ounce, $5. Plural, Maple Leafs. An Austrian silver trade coin dated 1780, but struck repeatedly since then with the one date. A metal punch used to produce “working hubs,” which are then used to produce “working dies.” See also die and hub. A metal punch used to produce “master dies.” See also hub and master die. Especially U.S. gold coins of 1908-1916, coins produced from dies entirely sandblasted with no mirror surfaces. See also frost and Proof. An unidentifiable specimen, generally referring to a token. Depending on sources, a small medal no larger than 1 inch in diameter or a medal 35 millimeters in diameter or less. A large Roman presentation piece of the fifth century. Sometimes used for a large medal, usually 3 or more inches in diameter. A coin struck from about A.D. 500 to 1500. In coin collecting terms the unofficial nickname given to the USA Winged Liberty Head dime of 1916-45. The designer never intended the coin to depict Mercury, a male Greek god with wings on his ankles. The bust on the dime is an allegorical female Liberty Head figure with a winged cap. Also, some coins have been plated outside the Mint with mercury to give them a Proof-like appearance. In coin collecting terms extremely small lettering difficult to discern with the naked eye, used as an anti-counterfeiting device on paper money. In coin collecting terms milling refers to the devices on the edge of a coin; a milled coin is one struck by machine. They are related due to the rise of the importance of the collar with machine-produced coinage. A silver coin of less than crown weight, or any coin struck in base metal. The sheen or bloom on the surface of an Uncirculated numismatic object resulting from the centrifugal flow of metal caused by striking with dies. Mint lustre or bloom is somewhat frosty in appearance as opposed to the mirror-like smoothness of the field of a Proof. A letter or other symbol, sometimes of a privy nature, indicating the Mint of origin. Common term for an Uncirculated Mint set, an official set containing one of each coin struck during a given year. In coin collecting terms the highly reflective surface or field of a coin; usually mirror field with frosted relief. A clay or plaster three-dimensional design for a coin or medal. In coin collecting terms a coin struck after about A.D. 1500. In coin collecting terms a coin, token or medal whose obverse die is not matched with its official or regular reverse die. In coin collecting terms paper money issued in United States by national banks from 1863 through 1929 and secured by government bonds or other collateral. Also called national currency. See also bank note. An annual observance sponsored by American Numismatic Association to acquaint the public with the hobby and science of numismatics. National bank notes payable in gold coin by some California banks and one Boston bank pursuant to authorization by Act of July 12, 1870. See also bank note. A silver-white metal widely used for coinage, usually alloyed with copper. In the mid-19th century copper-nickel cents and 3-cent coins were also nicknamed nickel, like the USA 5-cent coin. The science, study or collecting of coins, tokens, medals, orders and decorations, paper money and similar objects. A person knowledgeable in numismatics, with greater knowledge than a collector. Greek denomination equal to one-sixth drachma. Note of an American bank of issue prior to 1865; a more accurate term than “broken” bank note, since many note-issuing banks converted into national banks or liquidated without failing. See also bank note. The side of a numismatic item which bears the principal design or device, often as prescribed by the issuing authority. In paper money, this is called the face. In slang, the obverse is the “heads” side. Printing method in which a metallic plate places an ink impression on an elastic blanket and is then transferred to the paper. Also, a term sometimes used to describe a blanket impression paper money error. In coin collecting terms a cardboard fiber token issued in the United States by the Office of Price Administration in 1944 during World War II. They were used to make change for meat and processed food coupons (to keep track of ration points awarded each family during periods of rationing). They were issued in red and blue versions. Both sides of the OPA token depicts a numeral 1 flanked by two small initials. See also token. The date made by a Mint engraver superimposing one or more numbers over the date on a previously dated die. Printed monetary instruments. Modern collectors may be challenged for a new term as nations experiment with plastics and other materials for their printed currency. The surface quality that a coin acquires over time as the metal reacts with the environment. In coin collecting terms coin-like pieces designed to test proposed coin designs, mottos or denominations proposed for adoption as a regular issue, struck in the metal to be issued for circulation and which were not adopted, at least in year of pattern issue. Do not use as a generic term describing experimental pieces and trial pieces. Popular term for silver Spanish 8-real pieces; often associated with pirate treasure. A piece struck on a planchet twice or more the normal thickness. The French spelling used in Europe is piedfort. In coin collecting terms Gold coins, often privately produced, struck in areas of the United States to meet the needs of a coin shortage, generally in traditional U.S. denominations. The U.S. Assay Office coins of California official coinage struck before the establishment of the San Francisco Mint are part of the series. Also known as private gold and territorial gold. The disc of metal or other material on which the dies of the coin, token or medal are impressed; also called blank, disc, flan. In paper money, a small colored disc embedded in the paper used as an anti-counterfeiting device. Abbreviation of philatelic-numismatic combination (or cover). A combination of a coin, medal, token or other numismatic item inserted into an envelope that is postmarked on a special occasion, such as the release of a new postage stamp. The numismatic item (or numis) is generally visible through a window in the envelope. The First Issue fractional note series. Forerunner of the postal money order, issued by the U.S. Post Office. A special U.S. Proof set, commemorating regular Proof coins plus commemorative coins of that year. Offered first in 1983 with 1983-S Olympic silver dollar; also offered in 1984 (with 1984-S Olympic dollar) and 1986 (with 1986-S Immigrant half dollar and 1986-S Ellis Island dollar). In coin collecting terms a small device used on coinage often commemorative in nature, similar to Mint mark in placement, but not indicative of Mint of origin. In coin collecting terms a coin struck on specially-prepared planchets on special presses to receive the highest quality strike possible, especially for collectors. For paper money, a print made to test the plate, analogous to a die trial strike in coinage. An Uncirculated coin having received special minting treatment and a mirror surface for the benefit of collectors, with minor imperfections due to the minting process permissible. A gold $2.50 coin of the United States. See also eagle. In coin collecting terms a comparative term denoting a high degree of scarcity. Often modified adverbially, e.g., very rare or extremely rare; or modified by the use of figures, e.g., R4 or R7. There is no universally accepted scale of rarity. Nickname given to A Guide Book of United States Coins, an annually published price guide. The cover is red, hence the nickname. Gives retail prices, or what dealers might charge for U.S. coins. The result of a minting process which creates vertical serrations on the edge of a coin. In coin collecting terms raised. In coinage and medallic numismatic items, a relief design is raised above the surface of the field. Sometimes called bas-relief. Opposite of incuse and intaglio. A numismatic item produced from original dies at a later date; in the case of a coin usually not with a view to meeting monetary requirements but to fill a demand for a numismatic rarity. In coin collecting terms the side opposite to that on which the head or principal figure is impressed. The side opposite from the obverse. On paper money this is called the back. Raised border around the circumference of a coin, not to be confused with the edge. Not common, but not as uncommon as rare. early hand-operated machine for striking coins. In coin collecting terms paper currency usually of denominations less than $1 issued as substitutes for currency to private persons or organizations. Tokens issued by coal mines and sutlers also are called scrip. The study and science of collecting financial documents, including stock certificates, shares, government and private bonds, and checks. A student of scripophily is a scripophilist. In coin collecting terms a device placed on paper money indicating authority of issue. Modern Federal Reserve notes have two seals, a green Department of Treasury seal and a black Fed seal. The profits resulting from the difference between the cost to make a coin and its face value, or its worth as money and legal tender. Most coins cost less to make than their face value; when it becomes too expensive to make a certain coin, size, weight and composition are often changed. In coin collecting terms the number used chiefly on paper money and sometimes on limited-issue medals to indicate order of production. Related coinage of the same denomination, design and type, including modifications, or varieties, of design. The Lincoln/Wheat Ears cents of 1909 to 1958 represent a complete series. An ancient Roman coin; plural, sestertii. Authorized by the Acts of Feb. 28, 1878, and Aug. 4, 1886. Were redeemable in silver coin, and in early to mid1960s, silver bullion. No longer produced, but all specimens remain legal tender although the notes can no longer be redeemed in silver. In coin collecting terms the popular nickname for certain kinds of protective coin encapsulation methods, especially those that are permanently sealed and rectangular. In coin collecting terms a term applied to the $50 gold coin issued by various private Mints in California from 1851 to 1855 occurring in both round and octagonal shapes, or to tokens manufactured expressly for use in certain coin-operated machines. A variety of coin on which the date is physically smaller than other varieties of the same year. Similar varieties include medium date and large date. In coin collecting terms a silver dollar-sized medal commemorating a special event. Popular collectible item, usually well-printed on heavy paper using an engraving used on paper money. They also contain information of a historical or commemorative nature. An issue of the U.S. Mint, containing the coinage of one Mint. It is generally sold only at the Mint represented by the coins. Coins produced under special conditions by the United States Mint at San Francisco during the years 1965, 1966 and 1967. Coins have no Mint marks. In the form of coin, especially precious metal coin; paper money redeemable in coin. From Latin meaning “in kind”; see also fiat money. Mainly intended as replacements for notes that were damaged or produced with errors or mistakes at the Bureau of Engraving and Printing. On modern Federal Reserve notes, a solid star appears at the end of the serial number; on earlier notes, the star appears at the beginning of the number. Until the 1980s, star notes were also used to represent the 100 millionth note since the serial numbering machinery has only eight digits. In coin collecting terms refers to coins issued by one of four state governments (Connecticut, Massachusetts, New Jersey and Vermont) between the Declaration of Independence and the ratification of the U.S. Constitution when the states’ rights to issue coins were suspended. Among paper money, refers to notes issued between Declaration of Independence and Civil War by state governments. See also Colonial. Greek coin equal to two drachms or didrachm, or 12 obols. A gold $4 pattern never issued for circulation. Also struck in other metals. In coin collecting terms a token bearing a business name and/or address, and often intended as a local or adhoc medium of exchange as well as an advertisement for the issuer. The act of impressing the image of a die into a planchet, making a coin. The quality of strike is important when determining the amount of wear on a coin. In coin collecting terms rolls of coinage metal to be punched into planchets. An extra charge placed on an item, the revenue of which is usually earmarked for a specific fund. It has been the recent practice of the United States Congress to place a surcharge on commemorative coins, sometimes to benefit a worthy organization. The study of printed currency and related items; from “syngraph,” a writing signed by all parties to a contract or bond. Usually a piece of durable material appropriately marked and unofficially issued for monetary, advertising, services or other purposes. In coin collecting terms a silver dollar coin produced for overseas markets. The United States issued a Trade dollar between 1873-85 for use in the Orient. Great Britain also issued a trade dollar. Also used incorrectly to refer to Canadian trade tokens of $1 nominal value. Sometimes called a coin note. Issued under the Act of July 14, 1890. Redeemable in silver and gold coins. Silver coins issued by the Massachusetts Colony in three forms: Willow Tree, Oak Tree and Pine Tree. Issued between 1652-82 although all but one are dated 1652. In coin collecting terms a market value guide based on averages derived from auction results, dealer advertisements, price lists and other sources. Represents a guide, not firm buying or selling prices. A silver denarius of the Roman emperor Tiberius. A collection composed of one of each coin of a given series or period. Marketing name for American Arts Gold Medallions. Set of coins issued by the U.S. Mint, consisting of one of each coin issued for circulated. Also called Uncirculated Mint set, or unofficially, a Mint set. In coin collecting terms refers to the 32-note (or 32-subject) sheets of Federal Reserve notes being sold by the Bureau of Engraving and Printing. The 16-note and four-note sheets being sold are cut partial sheets, although they are often referred to as uncut sheets. Earlier sheets of U.S. paper money came with different numbers of notes. Having a design on one side only. In coin collecting terms extant in only one known specimen. Very often misused, as in semi-unique. A specific type of note first authorized in 1862 and called legal tender notes; name officially changed to United States notes in July 1873. By law, $346,681,016 in United States notes must be kept in circulation. The term United States note is not a generic term for all forms of U.S. paper money. A machine that squeezes planchets so that they have a raised rim, in preparation for striking. A collector who specializes in transportation tokens. In coin collecting terms a pictorial element of a bank note design that shades off gradually into the surrounding unprinted paper or background rather than having sharp outlines or a frame. In coin collecting terms a list given by a collector to a dealer listing items the collector needs for a collection. The dealer keeps the want list and attempts to purchase items listed on it for the collector. In coin collecting terms a design formed by differing thickness of paper during production; often used as security device in paper money. The severe polishing of a coin in an attempt to improve its appearance and salability to the uninformed. A form of alteration regarded as misleading by the numismatic community, and which actually lowers the value of the coin. In coin collecting terms an ancient Jewish lepton denomination coin of the time of Christ. Slight flange on coins or medals caused by heavy striking pressure, often characteristic on Proof coins. The metal is squeezed up the side of the die faces by the collar die. Sometimes incorrectly called wire edge. See also rim. Originally, substitute for coins first used in the 1931-35 depression, having originated in Tenino, Wash. Issued in round or rectangular form and in many denominations. Currently used for advertising and souvenir purposes. In coin collecting terms a metal punch that is used to impress images into coins. A metal punch used to produce “working dies”; right-reading. See also die and hub. In coin collecting terms a set of coins for any given year, generally containing one specimen of each coin from each Mint issued for circulation, and packaged privately, but not by the government.